[L to R] Top: Raj Malhi, Marvin Crist. Bottom: Brian Avery, Michael Rives, Liza Rodriguez, Shannon Perkins, Shannon Renee McDonald, Henry Amienor. LANCASTER – Local voters took to the polls Tuesday, April 10, for the General Municipal Election for the city of Lancaster. Two incumbents overwhelmingly defeated six challengers in the race for two Council seats, open for the full term of three years and eleven months. 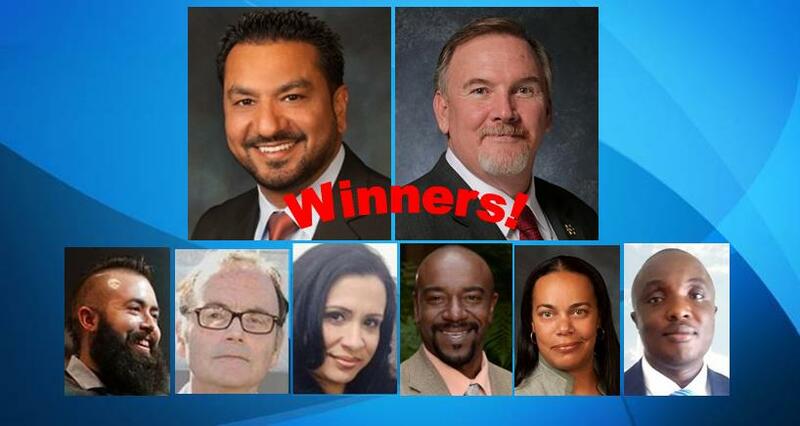 Raj Malhi finished first with a combined total of 3,374 votes, followed by Marvin Crist with 3,264 votes. The nearest challenger was Brian Avery, who took a distant third with a combined total of 722 votes. The combined precincts and votes by mail totals are below. View the detailed 2018 unofficial election results here. 32 comments for "Lancaster election results for city council"
There were two council seats up for election, so was the ballot a “vote for two” ballot? It seems like it should have been, but if it was then the 9000 some odd votes would really only be 4500 ballots, making the turnout not an abysmal 9000 but an even more abysmal 4500. Read the A.V. Times, April 2014 results in Lancaster. CAP’N LANCASTER Knows what’s up. You mean the people of Lancaster still haven’t caught on yet, that the election is in April? Why the heck are the elections in April? Lancaster has over 100,000 residents, yet less than 10,000 votes. People need to get motivated to vote to have their voices heard. @JB…Agree that people need to get motivated. With about 160,000 residents, and less that 10,000 votes, is pure apathy. I’m too lazy to research but what is the voter ratio? Well, more crime and less jobs. when will the people of Lancaster learn. Rex & his boys are the best thing to happen to Lancaster. Otherwise it’d be currently ran by idiots like who’s running Palmdale right now!!! Lancaster is running great. Higher crime than Palmdale. Junk bond status. Homeless all over the BLVD. Crappy roads that are masked with paint. Lower housing values. East Lancaster is the most crime ridden place in the high desert. We get low paying jobs by BYD. Palmdale gets High paying aerospace jobs. We also get to watch every new business open in Palmdale. We have the Jethawks, though. Take that Palmdale! Actually, the Victorville area is the most crime-ridden place in the High Desert, specifically the city of Victorville and the city of Adelanto. All of AV’s trash is being pushed out there and out to California City now. Correction: Victorville and Adelanto have the highest crime rates in the high desert. Yeap… and don’t forget you Cinemark IMAX. Lancaster has a population of about 160,000.00. Once again, Lancaster gets the politicians it deserves. Loving the fact that Rex’s boys Won like always! Isn’t the definition of insanity doing the same thing and expecting different results? We did it again. The waste of tax dollars on pet projects, cronyism, band aid fixes to roads like Tractionseal, the destruction of the West Valley with Valley Fever causing solar farms, the ignoring of East Lancaster, the increase of panhandling and crime on the BLVD, the failure of LEAPS, businesses going to Palmdale instead of Lancaster, bullying, and more will continue. Thank you people of Lancaster for keeping our decline going. We voted for it. We deserve it. Really? Why would Lancaster Baptist Church vote for a Hindu candidate (Malhi)? Do you people ever get tired of sounding r3tarded all of the time? Because their pastor has been bought and paid for by the Wrecks machine, and Malhi is a rubber stamp for Wrecks. Thanks Tim, you know what I’m talking about! Shame on any leader of a church, preaching politics from the pulpit. Trump signed something not too long ago allowing religious leaders to peddle politics. That is in direct contradiction with the separation of church and state as our Constitutional framers intended. But, I foresee conservative Constitutionalists not having any issue with this just as they have no problem with deficits that they create. I think it’s long overdue we have a centrist party or a 3rd party that doesn’t seek to divide, but unite. Ralph Nader could’ve actually gotten close in 2016, at least close enough to where his party would’ve qualified for federal election funding (I believe around 87 million or so) in 2020. Maybe one day the nation will wake up, or in this case, the town. Lancaster Baptist people do what they’re told. Just like the other big churches in Lancaster. It doesn’t matter that Raj votes for the pot grows. Pastor Paul and Pastor Chris are too tied into Lancaster politics for any changes too be made. It is sad and pathetic. @MrMister, the switch was made because it was correctly argued that a church leader does have the right to express their view to a congregation about a political candidate. It does not go against the Constitution. Now, if the candidate wins and then shoves their religious values down our collective throats, then that politician has gone against the Constitution. I know we can all point at a few currently in office around the country that do so. Or attempt to do so. Laughing, church leaders have always had the right to express their personal opinion, just like anyone else does. When they express that opinion in a manner that can easily be construed as an endorsement BY THE CHURCH rather than a personal opinion it is in fact not in keeping with separation of church and state, because allowing a church to exert influence over who is elected invites people who are elected to treat churches that endorse them preferentially. No argument against that was made successfully, or even tried. What Trump did was a response to claims that the method of enforcement of this element of the law was somehow “unfair” so would be stopped. It seems very clear that the people shouting about the enforcement being unfair are people who undoubtedly want to disregard the unconstitutionality of it and use their positions as ‘spokesmen for god’s position’ to influence elections. Since there is no avenue for enforcement they will undoubtedly get away with it, but that isn’t the same as it being legal. The next avenue of enforcement will be civil suit. If I were a candidate for political office and my opponent received endorsement from the pulpit I would get it on tape and sue for damages based on violation of my first amendment rights. It would be a pretty clear cut case that the church leader was using coercive tactics to force me to accept his religious beliefs, and I would very likely win. There are true shepherd’s, and there are false shepherd’s. The church is a body, and the head of the church is Jesus Christ. We are to identify with Him and His teachings. Lawsuits between brethren happen too often, but Christ teaches that we have already lost when we take our dissents to a civil court. It is the responsibility of each baptized Christian to learn discernment about what is true and false according to His Word. It is simple, yet complicated because of human reasoning that can so easily misinterpret.